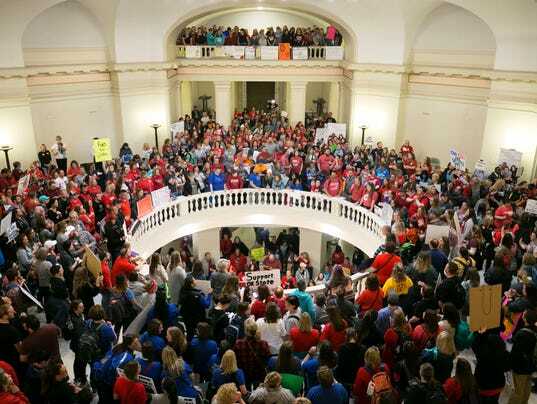 Oklahoma teachers seized every floor of the state Capitol on Tuesday during their ongoing strike for more education funding. Teachers and other school staff filled the Capitol on the second day of organized strikes, vowing not to leave until the Republican-controlled legislature passes more funding for school resources, ABC News reported Tuesday. Capitol security had to occasionally declare the building at capacity and temporarily shut the doors to prevent more teachers from entering. An estimated 36,000 people stormed the Capitol and stood outside. The strike moved into a third day on Wednesday as public schools remain closed due to staff shortages. The teachers are pushing for a $10,000 pay increase over three years. They also want a $5,000 increase for support staff. Oklahoma teachers receive an average salary of $42,460 a year, less than teachers in nearly every other state, according to the U.S. Bureau of Labor Statistics. Many Republican lawmakers have been resisting the requested funding. While historic, the Oklahoma Education Association, a teachers union, said it was “incomplete” and began the strike on Monday. GOP state Rep. Kevin McDugle vowed to vote against any measures to fund public education as retaliation for the teachers strike. “I’m not voting for another stinking measure when they’re acting the way they’re acting,” McDugle said on Tuesday. Kentucky teachers are also on strike and Arizona could see a similar statewide walkout soon. West Virginia teachers fought for a 5 percent pay raise in February.